- The president is hiding his taxes, still, and the Treasury Secretary is enabling him to do it. World leaders compared Trump to Hitler. A senior Trump official warned he endangers America. 50 GOP national security experts said Trump's unfit. US intelligence members warned Trump is not a king. Psychiatrists warned Trump is dangerous and unfit. When will the @GOP listen? 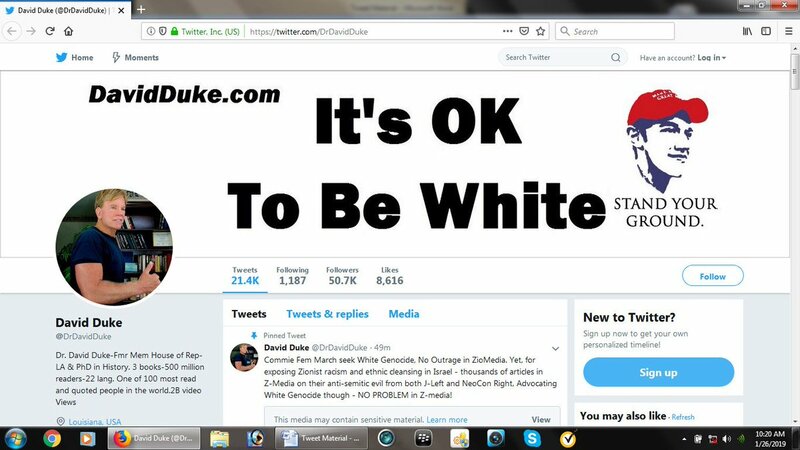 If MAGA hats are not analogous in many ways to the Klan's white hoods, why does former KKK grand wizard David Duke hold the #MAGA hat boy out as a symbol to rally around by having his picture on his Twitter header? If MAGA hats are not deeply connected to the KKK, why did David Duke say that he and @realDonaldTrump share the same message? I've said it before and I will say it again: @realDonaldTrump is not a legitimate president. His presidency is built on lies and fraud. I was in a building locked down during a shooting and my mother and I were stalked by a man with a gun. I've also read the research. Guns do not make us safe. They only create the illusion of safety while profiting the NRA and gun manufacturers. As an educator, I support our children walking out today. They deserve to be in school, learning in a safe environment. But when so many adults put profits before life, it's time to stop and listen to our children. If guns made us safer, as folks in the @NRA like to say, America, which owns nearly half of the world's privately owned guns, would have the fewest mass shootings in the world. Instead, we have the most.